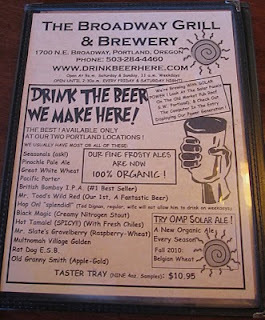 A couple weeks ago on my way home from Zwickelmania at Breakside, I decided to pop in to the Broadway Grill and Brewery at NE 17th and Broadway. 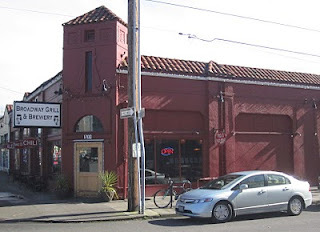 If you're not familiar with it, it's an outpost of Multnomah Village's Old Market Pub and Brewery. 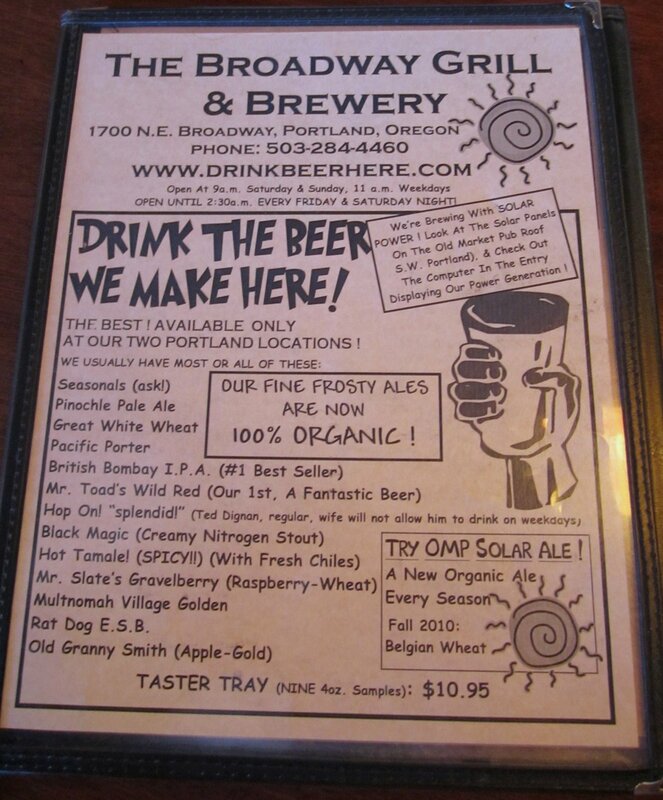 The first time I'd been to the Broadway Grill was a few years ago when some of us were over at the McMenamins on Broadway to drink some of Corey's beers. After leaving McM's, we noticed the Grill, and since none of us had ever heard of it, we stopped in to check it out. At that time we found that the beer was not very good. But I've noticed that the last few times I've had an Old Market beer at a beer festival I've really enjoyed it, so I thought I would give the place a second chance. Plus a sign hanging out front that advertised homemade chili called out to my lunch-deprived belly. Now, I said the place was family friendly, but what's up with the kid's names on the beers? Mr. Toad? Mr. Slate (you know, from the Flintstones)? Old Market says their beers are now 100% organic (I have to assume they are not including the hops). They seemed to have a handle on the English ale range, but the other things I tried were not very good. Next time I go back I need to try the beers flavored with chili peppers and apples, and I'd like to venture further into the seasonals, given the good luck I've been having with Old Market at festivals. All in all, I'd say it's worth a visit if you're in the neighborhood or if there's a game on you want to watch. Broad array of house beers; stick to the IPAs if you can't stand a disappointment. My experience at Broadway is that their seasonal Vanilla Maple Stout is really, really good, and the other brews can be hit or miss. Once again, it seems like the seasonal brews get more attention than their regulars and the quality seems to show. Unfortunate, because the seasonals show that they can brew a good beer. The Amber is great. Thanks for the reminder of existence. Also, if you don't brew beer on premise, you are not a brewery. Period. It's just false advertising a la Mickey Finns.